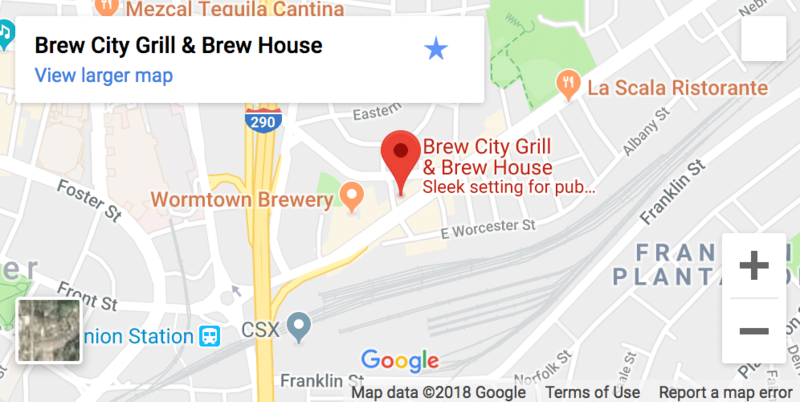 Brew City is Worcester’s original beer bar featuring an award winning selection over 165 beers with 41 on tap; including 3 cask conditioned ales. Brew City also offers a full bar in a casual upscale comfortable setting. Enjoy a beer inspired seasonal menu featuring fresh, local ingredients. Plus, the area’s first burger bar, enjoy our signature burger creations or build your own from an extensive menu. Come check out our “Happier Hour” drink menu! Appetizers are half price, Monday – Friday, 3pm-6pm. Plus, beer, wine and cocktail specials available every day. Check out all of our AMAZING BURGERS! Click view more to check them out! Have your favorite Brew City apps or entrees delivered to you! BURGER NIGHT: 1/2lb Angus Cheeseburger with fries … only $4.99! Monday Nights after 4pm. TACO TUESDAY: $2 Tacos every Tuesday after 4pm. CREATE YOUR OWN PASTA ENTRÉE: Choose from 3 pastas, 4 house-made sauces and 5 proteins…starting at $9.99, every Wednesday after 4pm. SEAFOOD TRIO NIGHT: Maine Lobster Roll, House-made N.E. Clam Chowder and Clam Cakes, every Thursday after 4pm… only $23.99!